My first blog post went up on December 6, 2007, which means I have seven happy years to celebrate on this blogoversary. In that first post I wondered whether 67 was too old to begin blogging. I guess I didn’t need to worry. I don’t have statistics until 2010, but since then I have written 1582 posts and received over 6000 comments. I don’t feel a day older and there are many new ideas and plants, and gardeners out in the world to meet and learn from. And many wonderful books. In that first post I mentioned Eleanor Perenyi’s book Green Thoughts and I have written about many more garden books since then. 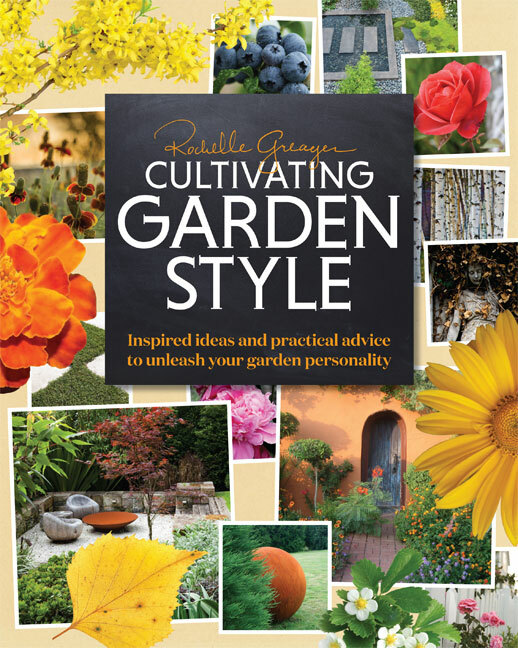 On this Seventh Blogoversary Timber Press and I are giving away a copy of Rochelle Greayer’s new book Cultivating Garden Style: Inspired ideas and practical advice to unleash your garden personality. This bright and cheerful book contains hundreds of ideas for creating a beautiful and personal garden. Browse through the wonderfully illustrated page and consider – is your garden Wabi Sabi Industrial? Hollywood Frou Frou? or a Pretty Potager? Do you long for a Forest Temple? A Sacred Meadow? Or are you Organic Modern? Of course, as you browse you might think you cannot pigeonhole yourself like that, and why should you. Rochelle herself describes her garden as being influenced by her childhood in Colorado but she’s a little bit Rock ‘n’ Roll as well as Handsome Prairie. We all deserve to let our best selves shine, but sometimes we need information about how to make that happen. What do you know about decking or outdoor fabrics? Rochelle has answers and ideas. I will also be giving away a copy of my own book, The Roses at the End of the Road, with charming illustrations by my husband. I do give some basic information about growing roses, but when people ask me what my secret of success is I always say it is choosing the right rose. I don’t fuss with my roses or use any poisons. I was a beekeeper and I treasure all the pollinators who come into the garden. I do talk about neighbors, the history of roses, and my own adventures among the roses. I had no long held desire for a rose garden until I planted the Passionate Nymph’s Thigh rose and thus began my own love affair. There is no explaining passion. To win both of these books all you have to do is leave a comment here by Midnight on December 13 here I will draw a winner at random on Sunday, December 14. Once I have the winner’s address, I will send the books right out. You’ve got to love a man who thinks you look like this. And I do! I found you a couple of years ago through AtoZ, been enjoying your posts ever since. I would love to be entered. I have not yet grown roses, but always wanted to! Always enjoy reading a new book – I already have Roses at the End of The Road which I purchased a couple of years ago and thoroughly enjoyed reading it as I used to visit my grandparents (The Peters at Peters General Store) when I was a child and spend some time with them during the summer and always loved Heath. I still have many relatives that live in the area. Also must add that I really enjoy reading the Commonweeder. If I am selected as the winner, I think your book would be a wonderful gift. I always enjoy seeing Commonweeder in my inbox. 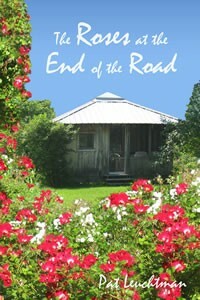 Have been wanting to read Roses at the End of the Road for some time and Cultivating Garden Style also sparks my interest. Would love to see your roses in person one day! Perfect time to give away 2 gardening books. I’ll curl up with either one. Happy blogiversary, Pat! I’m so pleased I’ve met you in person. And that I have my very own copy of your book already. I really enjoyed it, especially how I got to know you better through it. 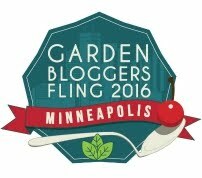 Maybe I already have a Mary garden although I had never heard of it until I read this post. What gardener doesn’t enjoy receiving a new garden book. Thank you for the opportunity. And how wonderful that your husband was able to illustrate your book. You share a passion together. What a delight. Your blog is a favorite. I am intrigued by the terms she is using for Garden Style – once I have satisfied my curiosity I will pass this along to a lucky Greenfield Garden Club raffle winner at a future event. I already own your book, Pat, and will no doubt gift it to another local resident to share the love! Happy blogiversary and many more! Love the ‘portrait’. We started blogging the same year. It seems like yesterday. Happy Blogaversary, Pat! It’s always a delight to read your posts, and I hope to be reading them for many years to come. I had a neighbor friend who once described my garden as reflecting my hippie style. Not sure what she meant by that–I was a child of the sixties, but not a hippie–unless it was the riot of clashing colors of my daylilies:) I’d love to win either book; I’ve always meant to order your book, so if I don’t win it this time, I will stop procrastinating and order it! Congratulations, Pat! Seven years is a real milestone for a blog. Wishing you many more years of blogging and gardening. Congratations! I enjoy your blog and hope you continue for many years to come! Are these books available at World Eye? Happy blogaversary Pat. I thoroughly enjoy your blog and I enjoyed reading your book too. Congrats on your blogaversary! I love gardening! Think spring…. I LOVE ALL YOUR ARTICLES & PICTURES ! KEEP UP THE GOOD WORK , I HAVE LEARNED ALOT FROM YOUR BLOG. Happy 7th Blogoversary Pat! I will begin my first garden in New England this spring, and am looking forward to learning more gardening tips from your blog and newspaper column. 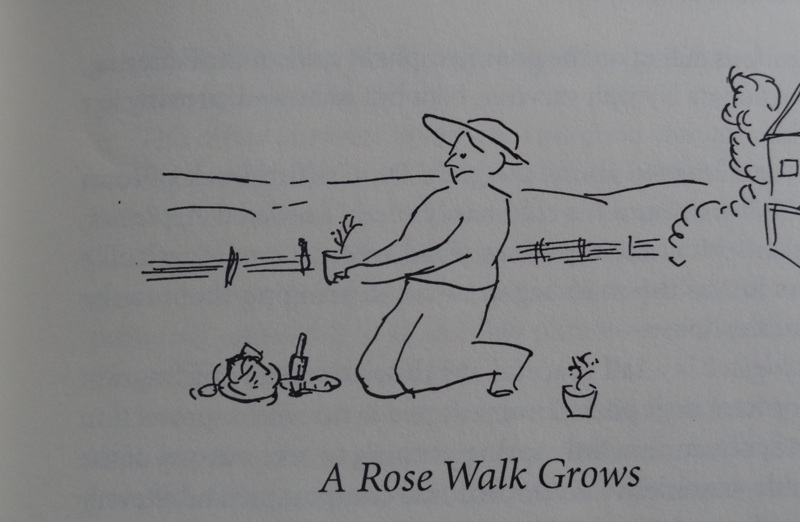 Given your book, I think I will also try planting some roses at the end of the road. Congratulations on 1582 posts and 6000 comments! Please enter my name to win both books, which look very interesting. I need a great garden book to read for the cold winter evenings. It helps boost my dreams and plans for spring. I read your posts in reverse order reading the recent one about the giveaway first and I entered there, but I am popping in to wish you a belated anniversary…a wonderful achievement…congrats Pat!